Additional information about St. John’s history and architecture can be found at our church historian’s web site. 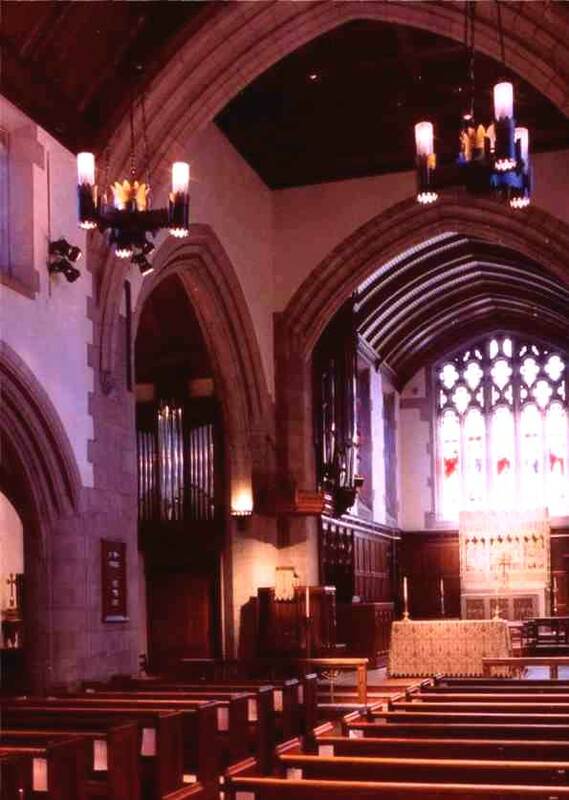 With a presence in the communities of Hartford and West Hartford for more than 175 years, the congregation of St. John’s Episcopal Church has continued to play an important role in the history of Connecticut and areas throughout the world. Among clergy, worshippers, and others affiliated with St. John’s have been famed author Harriet Beecher Stowe, Elizabeth (Mrs. Samuel) Colt, Gideon Welles (Secretary of the Navy for President Lincoln), Franklin Whitmore (Mark Twain’s private secretary), Dr. John Franklin Enders (a Nobel Laureate), the leaders of important national and international corporations, three priests who became bishops of the Church, and other notables. As explained below, the people of St. John’s have traveled their Christian journey together and have shared joys and sorrows, have worshiped in beautiful buildings and temporary properties, and most importantly have grown in their understanding of God’s presence in the world and their mission in the service of God and others. 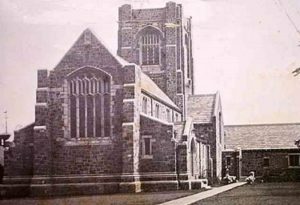 Please read below to explore the history of St. John’s Church (both in words and pictures). The history is divided into three main periods of the life of the church: 1841 – 1907; 1907 – 1995; and 1995 – present day. The early history of St. John’s Church is intertwined with the growth and development of Christ Church Cathedral, shown at left. Hartford became the parish seat of the Diocese of Connecticut in 1785 and by 1792 a wooden edifice was built at the present site of the Cathedral at the southwest corner of Church and Main Streets. 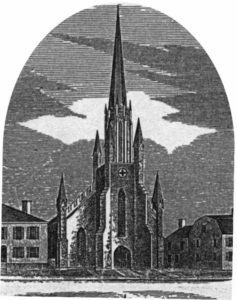 Opened in 1795 and consecrated in 1801, Christ Church became increasingly less accommodating as the number of Episcopalian faithful grew beyond expectation. The original Cathedral building was replaced by the present Gothic style building in 1829 but only eleven years later the Rector informed the diocesan convention that Christ Church was nearing its limits for new congregants. 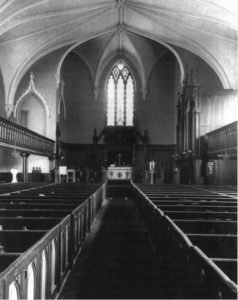 The space crisis at Christ Church spawned a debate as to whether the present edifice would be expanded (a second building would serve as an extension of Christ Church’s parish) or if an entire new parish would be developed at a nearby location. 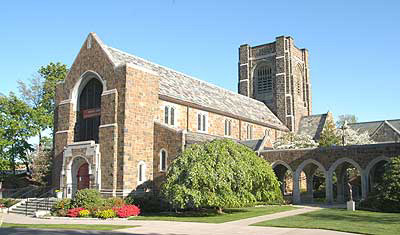 With the urging of Christ Church’s Rector and the support of several prominent businessmen, bearing well established names like Brainard, Eaton, Goodwin and Huntington, and professors from Washington (later Trinity) College, St. John’s Church was incorporated in 1841. Through the years a number of improvements were made to the building. 1847 brought a bell (later moved to the St. John’s Church building on Farmington Avenue, West Hartford), 1849 saw the introduction of gas lighting, in 1850 an elaborate iron fence similar to the one at Christ Church was erected and in 1856 a furnace, typically cantankerous for its times, was added to the basement. As the number of parish activities increased other remodeling was done in a piecemeal fashion and meeting rooms were squeezed in here and there. 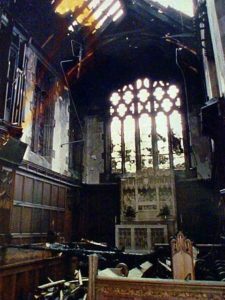 In the summer of 1874, the church closed for cleaning and repainting – something which was a necessary byproduct of the soot and smoke of nineteenth century city life. Shortly thereafter it was discovered that the spire was structurally unsound and in 1875 this prominent feature was removed, leaving the church’s profile permanently altered. 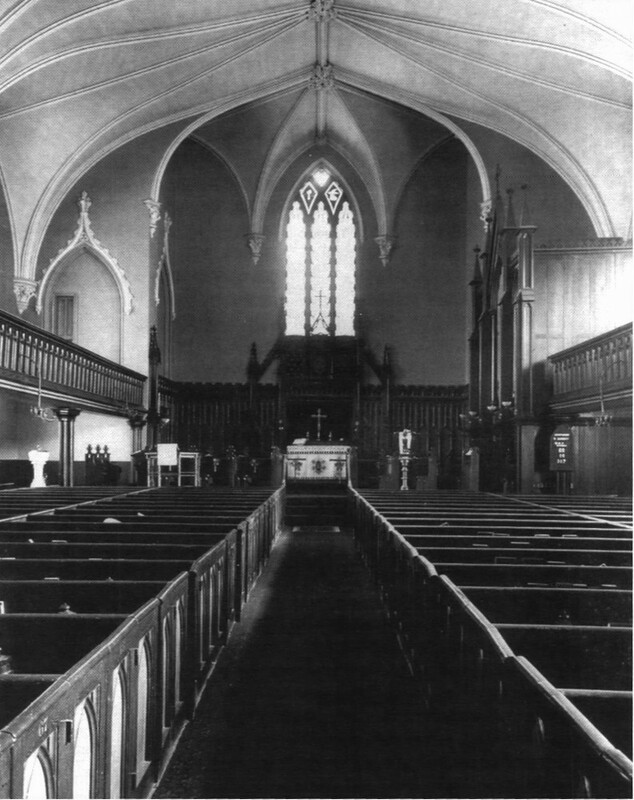 The year 1887 brought stalls for the recently organized vested boys’ choir, a new pulpit arrived also in 1887 and in 1888 a marvel, electric lighting, was installed. As the 19th century neared its close various additional cosmetic improvements were made, including one significant alteration, moving the organ from one side of the church to the other to make space for a vestry room. 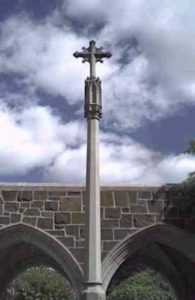 Through its history, St. John’s Church has been an active “parent” for several other parishes: Grace Church, Windsor (1841), St. James’s, West Hartford (1843), St. Mary’s, Manchester (1844), St. Paul’s, Hartford (1850), St. John’s, East Hartford (1854), Church of the Good Shepherd, Hartford (1866), St. James’, Hartford (1868), and St. Monica’s, Hartford (1904). The Hartford churches, in particular, presented a problem for St. John’s Church in that many of its own parishioners, lured by the ongoing growth of Hartford to the west, left for the new offspring churches and for other Episcopal congregations like the now defunct St. Thomas’ Church. 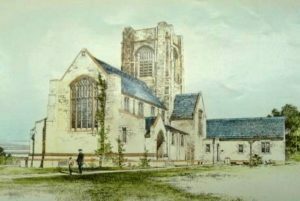 As early as 1885 proposals were made to combine St. John’s Church with a number of other parishes but the efforts came to nought. By 1905, St. John’s Church had seen a serious decline in the number of both regular attendees and parishioners formally listed on its rolls. Additionally, the spire-less building, as shown at right circa 1900, was having a number of physical plant challenges. Coincidentally, Hartford native J.Pierpont Morgan, one of the nation’s wealthiest individuals and himself a dedicated Episcopalian, was pondering a significant gift to the Wadsworth Atheneum. The Atheneum, the nation’s oldest publicly supported museum, was located only two buildings to the north of St. John’s Church and the declining church’s property became a prime target for the expansion of the museum. J.P. Morgan, sensing an opportunity, offered $75,000 in 1905 for the purchase of the St. John’s Church building and property. 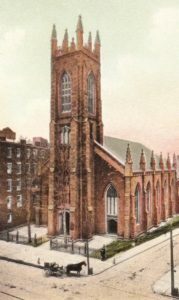 A deal was struck between the church and the museum and the last service in the original St. John’s Church building took place on Easter Day, March 31, 1907. 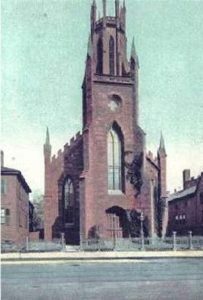 Upon the conclusion of negotiations with J.P. Morgan regarding the sale of the first St. John’s Church building and land (Hartford), church leaders began exploring options for the future of the parish. One alternative, rebuilding in Hartford, was ruled out in recognition of the fact that many of the city’s Episcopalians were moving west to the growing suburbs. Combinations with other existing parishes were explored but, as happened with earlier similar efforts, these explorations never achieved any result. As Gary E. Wait writes in his A History of St. John’s Church, West Hartford, Connecticut, 1841-1995, another possibility “was to jump over the neighboring parishes altogether and relocate St. John’s on the outer edge of the city.” This option won support when a well-timed, generous gift of a parcel of land, located just near the end of the city expanding trolley line, was provided by Dr. Thomas B. and John O. Enders. 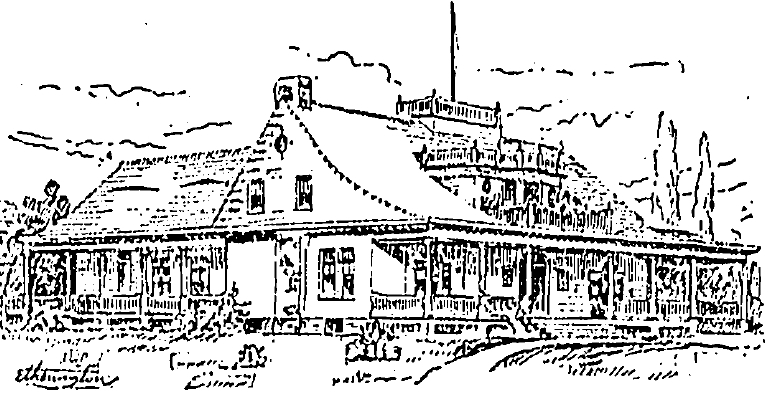 The parcel of land, which had formerly been the site of an entertainment and educational, but not gambling, venue called “The Casino” (shown left), provided the ideal site for the soon-to-be-homeless parish. The leaders of the church made a significant statement about their hopes for the future by choosing Bertram Grosvenor Goodhue to be their architect. Goodhue, then aligned with prominent Gothicist Ralph Adams Cram, was already one of the nation’s leading church designers and would later rise to fame as the architect of St. Bartholomew’s in New York, the National Academy of Sciences building in Washington, D.C., the campus of the California Institute of Technology, and the Nebraska State Capitol among others. 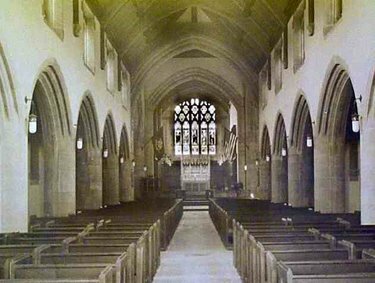 At the time of his design work for St. John’s, Goodhue was also creating plans for the new cadet chapel at the United States Military Academy at West Point and for two “English country churches” similar to St. John’s in West Haven, Connecticut, and Mount Kisco, New York. Mr. Wait writes: “The choice of Bertram G. Goodhue…proved to be a fortunate one. Having abandoned the auditorium model of church design, Goodhue and his partners favored the neo-gothic or tudor parish model characterized by a long, narrow and rather lofty sanctuary that rose to the column-supported clerestory above narrow side aisles…Admired as much for the beauty of his architectural drawings as for their realization in stone, Goodhue was, by the middle of the new century’s first decade, beginning to impose his own modifications on the “textbook” gothic of his earlier works. Aisles were narrowed by still further and low massive stone columns with neither base nor capital supported segmented arches, directing the eye upward to the clerestory windows above.” Bertram Goodhue’s sketch of St. John’s, above right in a colorized version, appeared in a published collection of his favorite accomplishments. 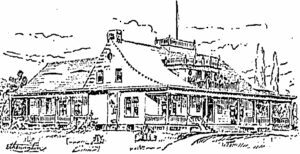 The original design called for a parish house, among other attributes, but the leaders of St. John’s, working with a limited budget, authorized only the building of the church, a sacristy and an office wing to the west. The photo at left shows St. John’s as built , with its main entrance facing Highland Street instead of Farmington Avenue . As part of the construction, a new organ, to be built by the Austin Organ Company, was made part of the church’s plans. In addition, some features of the old building, notably the communion rail, bell, pulpit, and lectern, were brought from Hartford. Almost immediately the parish began planning modifications to the original edifice and site and Bertram Goodhue was contacted to design an expansion to the church facility in keeping with his original ideas. As a result, a small parish house was completed to the architect’s plans in 1914-15. 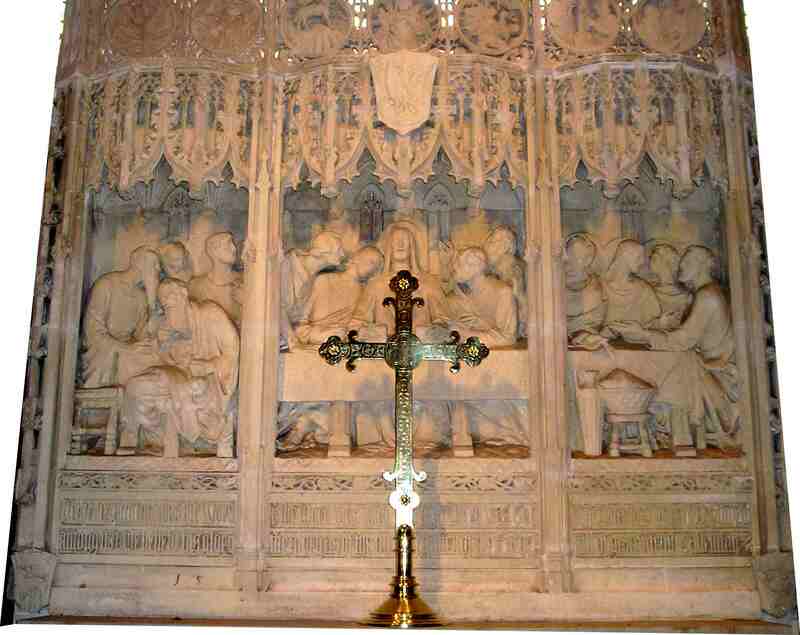 In 1923, a splendid reredos depicting the Last Supper was installed adjacent to the High Altar. The reredos, based on Goodhue’s hand drawn design, was crafted by renowned sculptor Lee Lawrie who frequently worked with Goodhue and had already completed the magnificent reredos, to Goodhue’s plans, at St. Thomas’ Church in New York City. 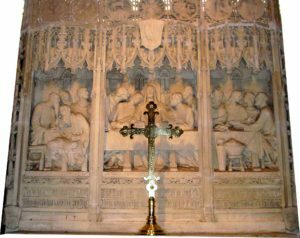 The Goodhue/Lawrie reredos, seen in detail below, is in the distance in the interior view from the late 1920s shown at right. To open the west side of the church property, several houses that stood between St. John’s and South Highland Street were acquired in preparation for new construction. Based on Goodhue’s ideas, the cornerstone of a new parish house was laid in 1927. At the same time, the church built its cloister and outdoor pulpit with peace cross (below). To alleviate a crush of parishioners trying to attend services, the construction program concluded in 1928 with the lengthening the nave by two bays towards Farmington Avenue to the north. Regarding the latter improvement, St. John’s also gained a new entrance on its north (Farmington Avenue) end, the previous main entrance having been on the west side of the nave at its northwest corner. At the behest of an athletic Rector, William T. Hooper, the church, which had become home to a billiard table in the early 1920’s, also added two bowling alleys in the basement of the new wing. Following America’s entry into World War II, the bowling alleys were converted into a children’s chapel to compensate for the loss of the Church’s reception room to the war effort (for the preparation of surgical dressings). By the mid-1950’s this space had outgrown demand and, as part of a general refurbishment of the church’s buildings, a children’s chapel was proposed. This addition, at the southwest corner of the Parish House, was designed by architect Robert H. Schutz and put into service in 1955. After over 50 years of complaints from the congregation about difficulty hearing the words of preachers, the parish installed an acoustical “board” over the pulpit in 1964 to better distribute sound. Two years later the first formal stained glass clerestory window replaced one of the many with geometrical designs that were installed when the building was new. The last of the early geometrical designs was replaced in 2001 as the result of generous donations from parishioners. By the mid-1970’s, the church began to show its age. A better ventilation system was installed, work began to restore the tower and roof, handicapped access was improved and the next decade brought a better sound system to the nave. As the 1990’s arrived, St. John’s was in the process of celebrating its 150th anniversary as a congregation. The old building was long gone and the new one had just passed its 90th year of operation. While frequent attempts had been made to keep them current, the building’s electrical and plumbing systems were becoming worn. The organ, which had been updated and expanded through the years, was audibly wheezing with the music director routinely climbing through its interior to make repairs (Note: for more information on the St. John’s Organ, please read the Church Organ History). 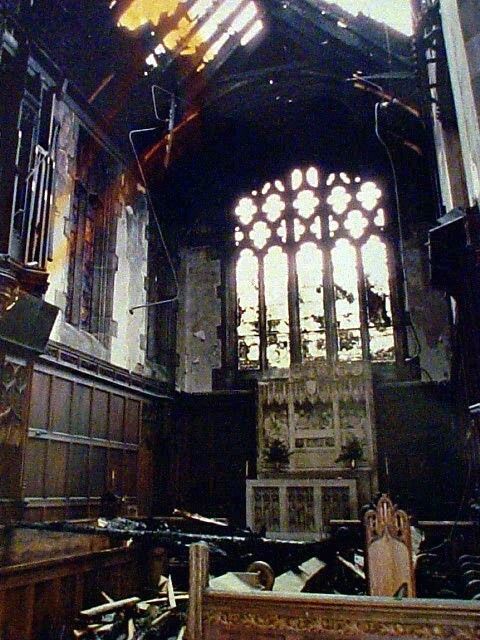 It was a mixed blessing, then, when fire, possibly started by spontaneous combustion, roared through the sanctuary and auditorium on Columbus Day weekend, 1992 (left). The church that would re-emerge from this near disaster would be more handsome than ever, would at long last meet current fire, building and handicapped-access codes, would be equipped with a celebrated organ, and would have a sanctuary more in keeping with the church’s interest in welcoming a diversity of people to its services. Damage amounted to over 5 million dollars but the parish pulled together under its still new Rector, The Reverend Joseph L. Pace, and vowed to rebuild. With the hirings of Ann Beha Associates of Boston, the building committee, co-chaired by parishioners Edward Eaton III, whose photo of the restored sanctuary appears below, and Richard Krissinger, a professional architect, made a commitment to restore as much as possible the nave/sanctuary design of Mr. Goodhue. Relatively minor structural changes allowed the incorporation of the new and much larger organ, the stained glass altar window was successfully rebuilt from photographs and glass bits, the chancel was lengthened with careful attention paid to reconstructing and replicating the original ceramic floor tiles, and other fully researched restorations/alterations were made. With the 1995 reopening of the still unfinished church, which had received additional funding via a capital campaign for further improvements, parishioners discovered new, yet somehow satisfyingly familiar surroundings. In addition to efforts to restore the main portion of St. John’s some significant alterations were made at other locations. The children’s chapel, where the first post-fire, in-house services were held, was completely redesigned to house the church’s new education wing. The St. John’s auditorium, all but completely destroyed from the fire, was expanded and completely rebuilt with a commercial grade kitchen. Today it is the church’s social center and also houses important community meetings and events. The choir rooms, which had made their home on the second floor of the Parish House since its construction, were relocated to the basement where they coexist with expanded facilities for the parish’s young adults. And, finally, a new parking lot was carved out of a lawn area behind the church adjacent to the Sexton’s house. By the year 2001, St. John’s was once again considering parking expansion and negotiations began to purchase a defunct automobile service station which had been a neighbor to the east. As part of a generous gift by Charles Matties, a long time political leader in West Hartford, the church acquired the property in early 2002 with the construction of a small, well-landscaped parking area following shortly thereafter. Maintaining a building like St. John’s is hardly a trivial pursuit. The clergy, staff and parishioners of St. John’s labor continually to assure that its spaces remain attractive, functional and conducive to the many activities carried forth within. We welcome visitors to our beautiful and historic church home and, more importantly, to our parish. While lucky indeed to have an architecturally prominent structure as the focal point for our services, St. John’s has always been and will always be the story of its people.